I initially considered Susan simply reluctantly agreeing to give reviewing videos a shot, but that wouldn't be Susan. She'll speak her mind and make herself the center of attention when she feels she should, and she's been on camera before, but she certainly didn't do those things for the fun of it. A no obligation offer that could potentially amount to just a free new movie rental and another movie night seemed like the right sales pitch for Susan. Huh. One paragraph. 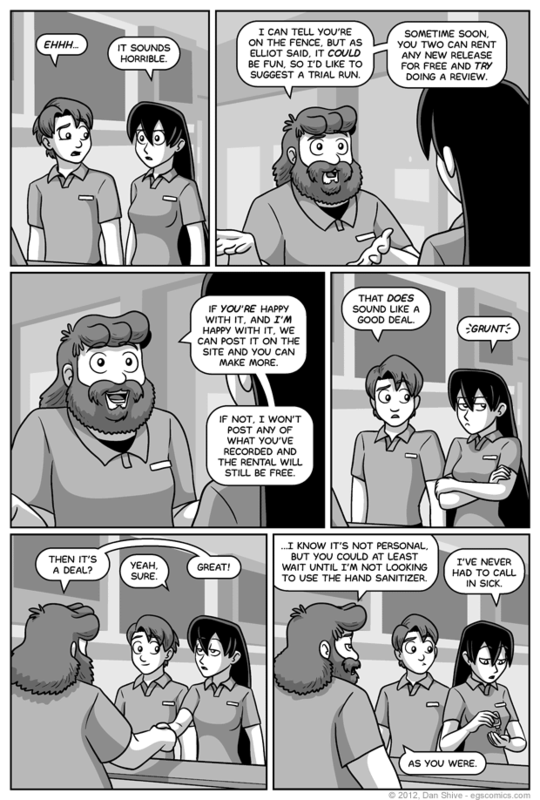 Um... Hey, Susan's keeping her hands clean again in this comic. HUZZAH! As I've probably mentioned before, if I do this after shaking your hand, it's nothing personal. Well, probably. If I'm glaring at you while I do it, then I probably saw you skip washing your hands or something.